The fireworks exploded on our dinner plate this fourth of July with this fantastic barbequed turkey. It was not your traditional bbq of burgers, dogs or ribs but it sure tasted mighty fine. We hope you had a tasty Holiday too. Perhaps not traditional but looks great none the less. Since it was raining, we had corn on the cob, boiled new potatoes, and fried okra all from a local farm. greatwhite hunter, Ms. Goofy did make a boat load of stuffing in the oven with buckets of gravy on the side. I sense a Meat Adventure in the near future. Are you in? Big Dude, We sure could use the rain here. You cannot beat fresh corn on the cob. It is one of my favorite non-meat items. 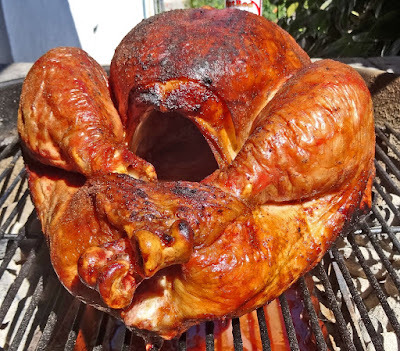 I roast/smoked a chicken on our Weber for the holiday - delicious! Zoomie, You cannot go wrong on the Weber. We cook a beer-can chicken frequently. Easy and tasty. Greg, It was a combination of hickory and apple. I love a turkey cooked to perfection. Not much better than that!